Supportive Move - modifications that precede or follow the Head Act and affect the context in which the actual act is embedded. 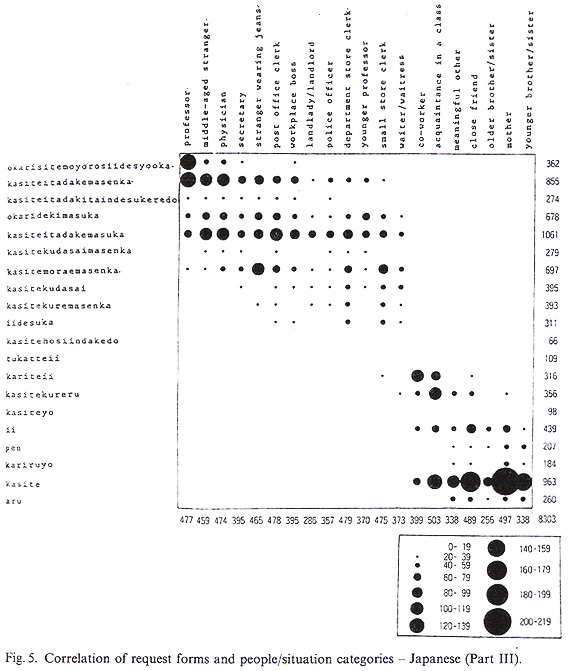 Chart form Hill et al. (1986), p. 355. Chart form Hill et al. (1986), p. 357. Above passages from Mizuno (1996a), pp. 94-95. 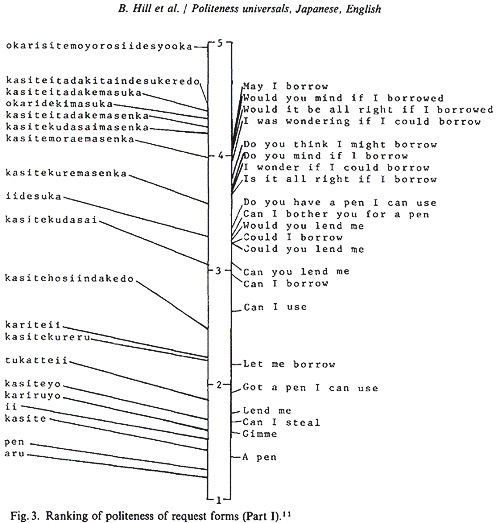 Similar to the situation with other languages (CCSARP project -- Blum-Kulka, House, & Kasper, 1989), Japanese requests can also be classified according to the perspective each request takes. By using the requester-oriented verb, morau to receive, the speaker emphasizes the role of the speaker ( Mizuwo morae masuka? Could I get some water?). On the other hand, the use of the hearer-oriented verb, kureru to give, or to let ~ have, may stress the role of the hearer ( Mizuwo kuremasuka? Could you give me some water?). 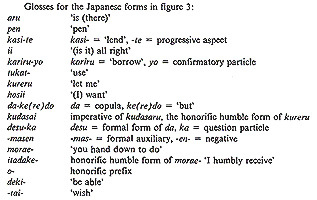 Requests in Japanese employ multiple perspectives as they are represented by the verb (e.g., kasu, lend or kariru borrow) and the honorific language. The use of honorifics, such as the hearer-oriented auxiliary verbs, kureru and kudasaru, and the speaker oriented morau and itadaku, implies the speakers varying degree of deference. Above passages from Mizuno (1996b), pp. 66-68. Above passages from Kashiwazaki (1993), p. 56. Japanese speakers would tend to vary their choice of request strategies according to their relative status in relation to the recipient of the request rather than the severity of imposition  behavior that has been referred to as "person-oriented" communication style (Mizutani, 1985). For instance, in interacting with those of lower status, a speaker tends to use fairly direct request strategy types, while the speaker may prefer much less direct strategies in speaking to those of higher status than him/herself. Whereas the relative status of the interlocutors often has an impact on the language use, the severity of imposition may have little impact on the directness of the request. For instance, a request in close or intimate relationship in Japanese tends to be casual (e.g., Okaasan, ocha! Mom, [make me] some tea!; Rinnert, 1999) to show intimacy, which would probably be viewed as rude or unrefined in English. However, in Japanese, a formal expression like Ochawo kuremasenka? Wouldnt you give me some tea? or Sumimasenga ochawo itadake masendesyouka? Id hate to bother you but couldnt I receive the favor of your giving me some tea? would be considered inappropriate in a close or intimate relationship. A minor request is not usually given in a formal expression to a family member or close friend unless the speaker is being sarcastic. This is in contrast to a more "situation-oriented" style (Mizutani, 1985) as in American English where speakers are likely to vary their politeness level depending on the situation and the severity of the imposition. An American request at a dinner table would likely be Can/could you pass me the salt? In English, formal requests are often delivered politely with some sort of mitigation or politeness markers even in a close relationship. Mizutani, N. (1985). Nichi-ei Hikaku: Hanashi Kotoba no Bumpoo [Comparison of Japanese and English Spoken Languages]. Tokyo: Kuroshio Shuppan. Rinnert, C. (1999). Appropriate requests in Japanese and English: A preliminary study. Hiroshima Journal of International Studies, 5.